In what may be a milestone in the history of U.S. ocean sciences, the National Research Council (NRC) released the first-ever Decadal Survey of Ocean Sciences (DSOS) report on 23 January 2015 [National Research Council, 2015]. Commissioned by the National Science Foundation’s (NSF) Division of Ocean Sciences (OCE), this report looks at the past decade’s key breakthroughs in understanding the oceans, identifies high-level research priorities for the coming decade, and makes bold recommendations for changes needed in the OCE budget to address these priorities. This is the first time the community was asked to generate research priorities constrained by funding availability and to examine holistically the entire Division of Ocean Sciences portfolio. No matter the outcome, the report is groundbreaking for one simple reason: This is the first time the community was asked to generate research priorities constrained by funding availability and to examine holistically the entire OCE portfolio. Although there have been previous community efforts to define future research objectives [e.g., National Science and Technology Council, 2007] and needed infrastructure [e.g., National Research Council, 2011], no prior reports grappled with the difference between what could be done with infinite resources versus what is affordable and the financial trade-offs between programs within the OCE portfolio. The motivation to conduct a decadal survey was the gradual shift over the past decade from an OCE budget where support of researchers to do science comprised more than 60% of the portfolio to one now dominated by investments in infrastructure. 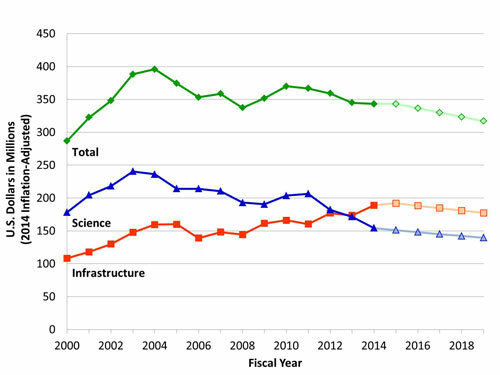 More important, flat or declining budgets meant that increased funding for facilities was subtracted from investments in science. Projections showed that if the OCE budget remained flat or increased only due to inflation, this trend would continue to the point where 60% of OCE funds would go to institutions to operate facilities while funds to support scientists would dwindle dramatically (Figure 1). Why Are Facilities Costs Rising So Fast? Part of the huge increase in facilities costs is inflation, but the bigger reason is the construction of new major facilities that were begun when the NSF budget was anticipated to double in 10 years. In the past decade, OCE has received Congressional approval for three major construction projects: an upgrade of the drillship JOIDES Resolution (2006), the Arctic research vessel Sikuliaq (2009), and the Ocean Observatories Initiative (OOI; 2009). The latter two were launched as part of the American Recovery and Reinvestment Act of 2009. It is important to note that the build costs for such projects come from NSF’s facility construction account, not the OCE budget. This might be viewed as an incentive to build facilities, but it merely delays a major budgetary impact on OCE. Over the lifetime of most facilities, the cumulative cost of operations will far outweigh those of construction. Under current NSF policy, operating expenses are covered solely from divisional budgets, yet instead of doubling, OCE’s inflation-corrected budget has declined by 15% over the past decade (Figure 1). Ironically, as budget pressures intensified, the importance of advancing knowledge of the oceans has soared. A major oil spill, tsunamis, mammoth coastal storms, declines of marine ecosystems, and the causes and consequences of a changing climate (to name a few) all brought the societal relevance of understanding the oceans into ever-sharper focus. The many compelling new research topics, the shifting balance between science and infrastructure, and the flat budget necessitated a new strategic approach. OCE sought a mechanism for community input on the crisis it was confronting, and DSOS was born. We commend the DSOS Committee for tackling the issues described above head-on. Prior to the study’s launch, some questioned whether 20 leading scientists from all sectors of the ocean sciences could reach a consensus. The problems were too difficult, the camps were too entrenched, and the effort may fail, or so we heard. This report proves that those fears were unfounded. We will not review the remarkable accomplishments of the past decade highlighted within the report nor comment on the eight high-level research priorities. We urge you to read the report yourself and to make reference to it in research proposals. The report also makes clear that the list of priorities should not be exclusionary and that NSF should continue to fund novel ideas. Findings that no one anticipated often become groundbreaking discoveries. Two things stand out in the report that will no doubt be controversial. First is the matrix approach to mapping the eight priorities onto the three major infrastructure categories. The outcome is that the fleet is critical or important to the largest number of priorities, ocean drilling comes in second, and OOI is third. This is not surprising, given that the fleet is designed to be multipurpose, the JOIDES Resolution is limited solely to drilling, and OOI is still under construction and so has yet to operate and prove its worth. The second major revelation is the recommendation to immediately reduce infrastructure expenses by 10% and implement a further 10%–20% reduction within 5 years, with the savings invested back in the core science programs. This rebalancing will eventually return the portfolio to a ratio nearing 60% science and 40% facilities. The cuts to facilities are weighted according to their synergy with the research priorities. Suggested reductions to the fleet are the smallest, OOI takes the largest hit, and ocean drilling is in between. The DSOS Committee considered but rejected, at least for now, the alternative approach of discontinuing any of these infrastructure categories to save the others from reductions. The report makes numerous suggestions about how to achieve greater operational efficiency by reducing the number of assets or platforms, contracting for services on an as-needed basis instead of owning or leasing full time, building partnerships with industry and private foundations, and, in the case of ocean drilling, asking other nations to foot a more equitable fraction of operating costs. If these operational efficiencies cannot be enacted, then termination is an alternative. The resounding message of the DSOS report is clear. There must be an immediate regime shift in funding from facilities toward investigator-based core science. Facilities are useless if you cannot provide grants for scientists to use them. This call deserves strong community support. The report points out the importance of the three major facilities in relation to addressing the research priorities and to the research careers of scientists who depend on these facilities. It is also true, however, that these same scientists and many others depend on science grants to fund their laboratories. Facilities are useless if you cannot provide grants for scientists to use them. Moreover, many ocean scientists do not use major facilities (e.g., only about 25% of proposals submitted to OCE request University-National Oceanographic Laboratory System ship time). The DSOS report also pulls no punches. Many will disagree with one or more of the recommendations. If so, then the committee likely did its job well because there are no easy answers and no way to satisfy all demands while maintaining a robust research community through individual science grants. Nothing is more powerful in government than an entire community speaking with one voice. Whether researchers agree with the report in its entirety or not, we urge all members of the ocean sciences community to support it. Nothing is more powerful in government than an entire community speaking with one voice. In the early stages of planning for this study, NSF heard from congressional staff members, the president’s Office of Management and Budget (OMB), and representatives from other decadal survey efforts. The message was clear: Congress and OMB easily disregard agency-generated reports and wish lists. In contrast, when NRC convenes a decadal survey composed of independent scientists willing to resolve internal differences and set priorities for the whole in the context of relative value, affordability, and national interests, its recommendations are hard for either branch of government to ignore. If supported by the community, this decadal survey will empower NSF for years to come in making the case for funding of the leading ocean science priorities. We view this report as transformational for the ocean sciences because it employs an “ecosystem-based” approach to managing all OCE investments based on community input. The role of the community, however, does not end there. The community must hold NSF accountable for using these recommendations as guidance in future budgetary decisions, especially given that the leadership of OCE and the Directorate for Geosciences changes every 3–4 years. DSOS also represents an opportunity to establish the ocean science community as a unified force. Now that we have defined our priorities, we are in a stronger position to lobby for more funds for ocean sciences as a whole. The collective will of the community that DSOS represents will be undermined, however, if special interest groups lobby Congress to insert language in the budget appropriations bill directing NSF to fund their own priorities. We discourage such practices. We also encourage NSF to sponsor a “refresh” of the report to be completed 5 years hence, with planning for the next decadal survey beginning shortly thereafter. Most important, we urge that future plans for major initiatives or infrastructure be vetted through the decadal survey process before they are launched. The true value of a decadal survey accrues when it becomes the standard means by which a community comes together on a regular basis to speak with one voice about priorities for advancing knowledge. National Research Council (2011), Critical Infrastructure for Ocean Research and Societal Needs in 2030, Natl. Acad. Press, Washington, D. C.
National Research Council (2015), Sea Change: 2015–2025 Decadal Survey of Ocean Sciences, Natl. Acad. Press, Washington, D. C.
National Science and Technology Council (2007), Charting the course for ocean science in the United States for the next decade: An ocean research priorities plan and implementation strategy, Exec. Off. of the Pres., Washington, D. C.
D.O.C. was the director of the Division of Ocean Sciences at NSF from July 2010 to December 2013. D.A.B. held that same position from December 2013 to January 2015. The views expressed are solely the authors’ and not do represent those of NSF or of their current institutions. Citation: Conover, D. O., and D. A. Bronk (2015), A transformational path forward for the ocean sciences community, Eos, 96, doi:10.1029/2015EO026811. Published on 26 March 2015.